Check out another review about responsive themes for WordPress here. 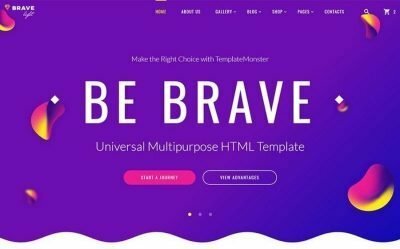 In this publication, we are going to cover the best 10 Bootstrap 4 Website Templates. Thanks to a Bootstrap in a core, the themes are highly adaptive and work flawlessly on any modern gadget including tablets, laptops, desktops, and even smartphones with high pixel density displays. Unpacking the theme you will find a lot of web elements, premium plugins, rich UI kits, additional instruments, and many other components intended to help you build a fully-fledged website. Most of templates include numerous ready-made HTML 5 pages for any purpose. This allows you to experiment with your site structure and implement any idea. If you do not want to spend much time on searching for high-quality images for your web page, feel free to use the ones already included in the package for free. The images are flexible and will be rendered correctly without quality loss. Besides, some of the themes feature a blog option which gives you an opportunity to make your site look reliable. You can share your ideas, the latest news in your business field, or any other useful data with your audience. Applying a testimonials function to your web page you make the communication with your visitors even more interactive. In case the clients cannot find the information they are looking for, they can contact you through a neat and easy-to-use contact form. Meanwhile, if they want to stay updated on the latest news of your website, they can use the newsletter subscription form also available out of the box. Various animation effects and transitions like parallax or video background, live search, back-to-top buttons, drop down menus, and many other elements are included in the package to take the user experience, website browsing and navigation to a completely new level. In addition, HTML themes come with detailed documentation and offer a top-notch support which will help you resolve any of the issues. This modern multipage website template has been specifically developed for architecture purposes. 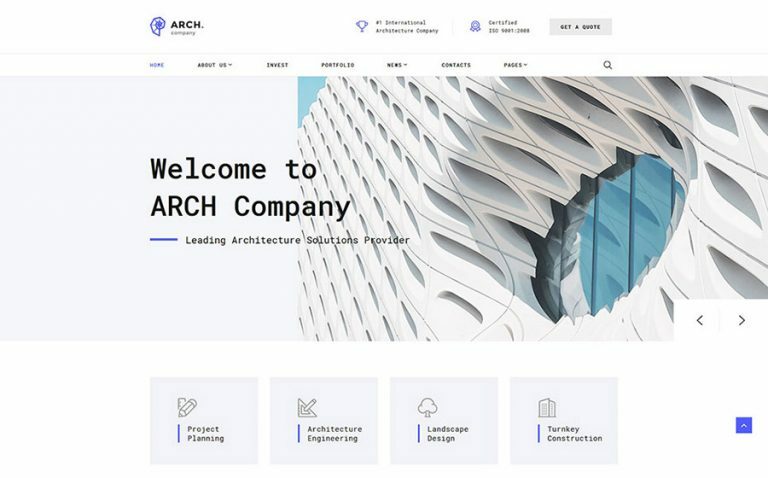 Featuring clean and responsive design, Arch also offers a number of premium functions that will help you build a fully-fledged web resource: 20+ pre-styled HTML5 pages, bundle of high-quality topical images, gallery and blog option, mega footer, parallax animation, and powerful search engine. In case any issue occurs, feel free to check out the built-in detailed documentation or communicate the inquire to a professional support team. Brave Light is a multipurpose theme that includes everything you may need for building a highly-functional website from a wide range of UI elements and blocks to 45+ ready-made pages, various working forms, 4 blog layouts, e-commerce pages templates, and many more. Meanwhile, steep CSS3 animation effects and transitions make your visitors stay at your site for longer and learn more about your project. Multiple gallery types, such as grid, masonry, and cobbles give you an opportunity to experiment with your pages structures, while dropdown menu, back-to-top button, and live search allow you to provide a high-class user experience. 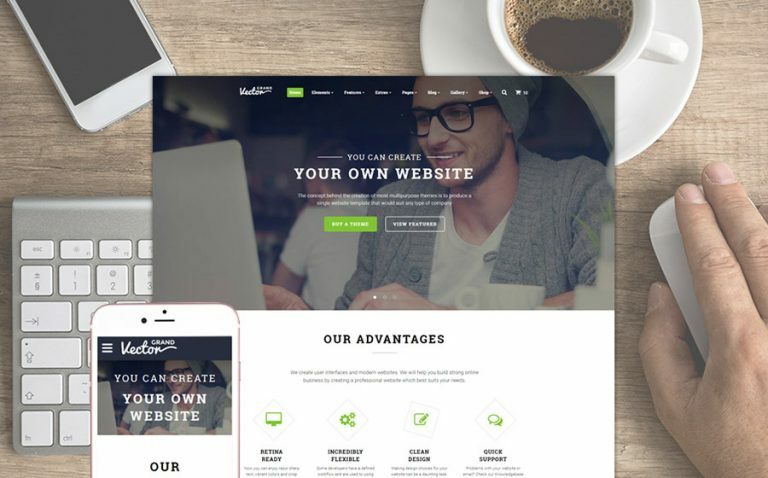 Meet another multipage website template built with Bootstrap 4 which guarantees a perfect performance of your site on any modern device including tablets and smartphones. 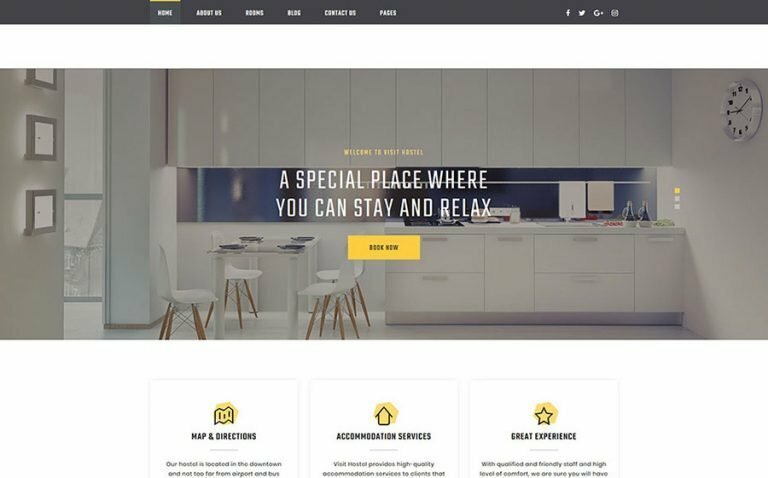 Designed specifically for hostels web projects the theme comes with an easy-to-use menu, fully flexible layout, various types of forms like registration and contact form, testimonials block, and much more. A number of blog layouts, animation effects like parallax, and Google map integration are also included to help you create a user-friendly resource. 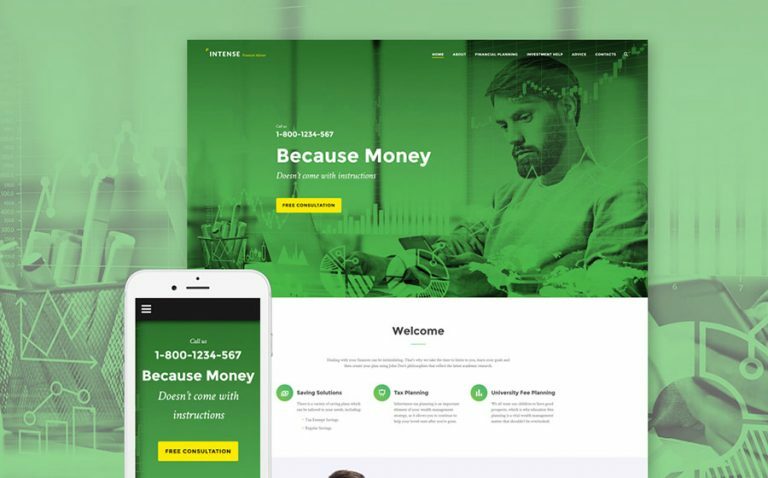 If you want to create a fully-functional website, try this Financial Consultant theme. Opting for it you will get a bunch of various options and features like numerous buttons, contact forms, progress indicators, and much more web elements that should help you establish a reliable image of your business and enhance the conversions on your site. Being fully optimized for speed Intense also provides working Ajax forms, clean and valid code, parallax animation, isotope filtering, SEO optimization etc. Since this template belongs to Intense family, it i equipped with additional niche templates, skins, ready-made pages, PSD files, SCSS and Jade files, and more. 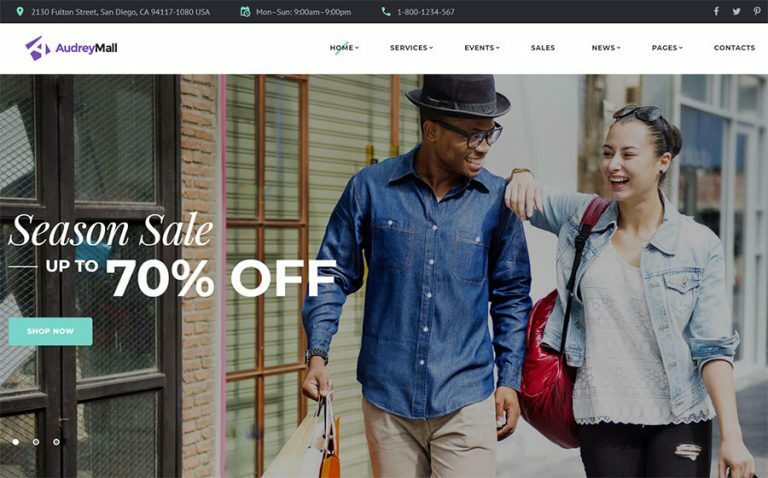 Audrey Mall is a fully responsive and cross-browser compatible website template that can be used for different purposes. Supplied with e-commerce page template and 5 log layouts the theme allows you to establish an online store with blog integration. This will let create a trustworthy image of your store and increase sales. Other features such as rich UI kit, 35+ ready-made HTML5 pages, numerous gallery types, Lazy Load effect, and other elements are included to add an extended functionality to your web page. Do you run an official city government web resource and need a reliable option for improving its design? Then you’ve come to the right place. 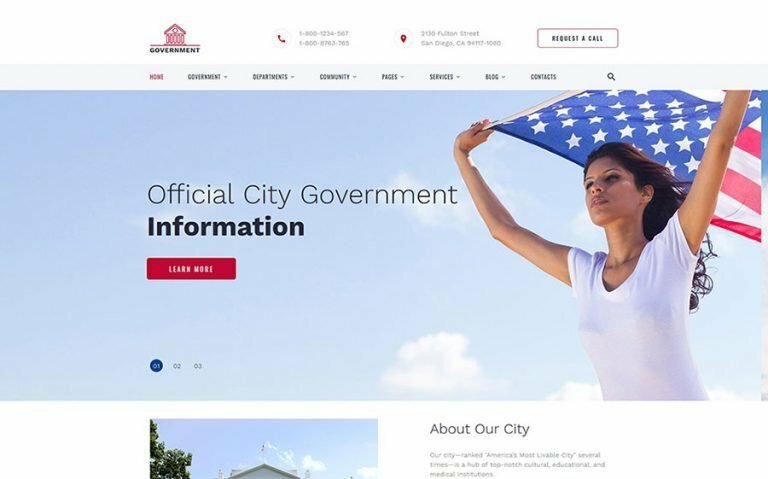 Government website template features an adaptive layout, image with logo, menu panel, unimpeded scrolling, modern animations, and much more web elements and instruments that may serve while building a professional website. Easy-to-follow documentation and friendly support are intended to resolve any of the issues that may occur within the building process. Grand Vector is suitable for any kind of businesses. 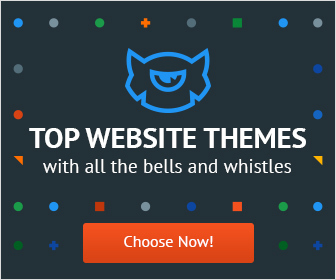 When downloading the theme you will find a lot of steep features that will help you create a stylish website. There are more than 50 ready-made pages, multipurpose header and footer layouts, live search and contact form, a number of the other working forms, parallax animation, multiple gallery types including cobbles grid, grid with no padding, and grid with padding options, 6 blog layouts including blog timeline, e-commerce page template, live chat, responsive slider, and many other elements available out of the box. 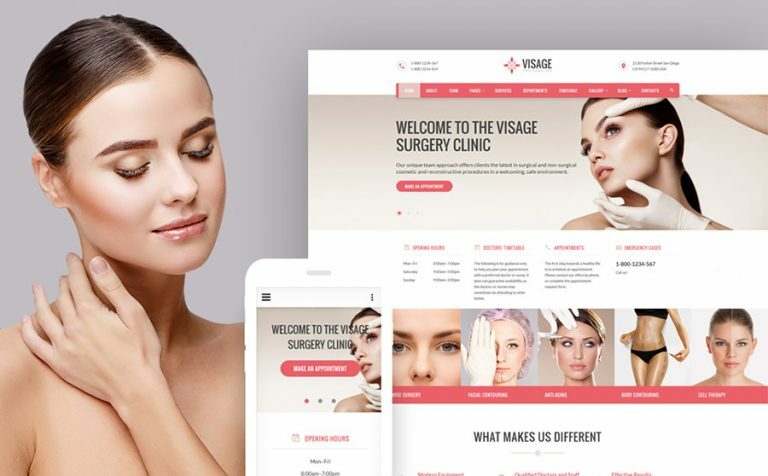 Visage has been specifically developed for plastic surgery clinic websites. It is characterized by a fully responsive layout which contributes to a flawless site performance on all modern gadgets. Besides, you’ll get everything you need for designing a fully-fledged website with intuitive interface and user-friendly navigation: rich UI kit, more than 45 pre-styled HTML5 pages, appointment manager, numerous header and footer layouts, parallax animation, numerous gallery types, and 5 blog layouts. With no doubt, every law company should have a trustworthy online presence to attract more clients. Using Fenimore website template you can easily reach this goal. 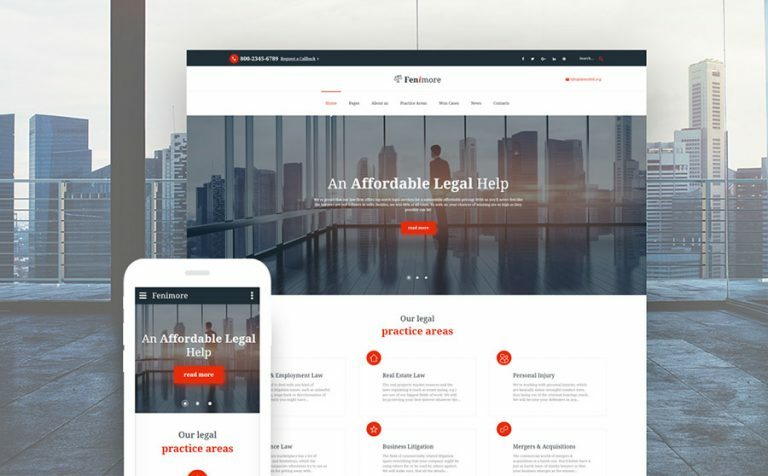 With the help of blog layouts available out of the box, you will be able to post the latest news in law field, share the principles of your work, the experience of your clients, and other useful information with your audience. Meanwhile, live search and contact form will let your visitors find the required data in no time or get in touch with you to inquire the additional information they’ve not found on the site. Fenimore will help you provide a user experience of a completely new level. Try this bright HTML template if you are running a university website. 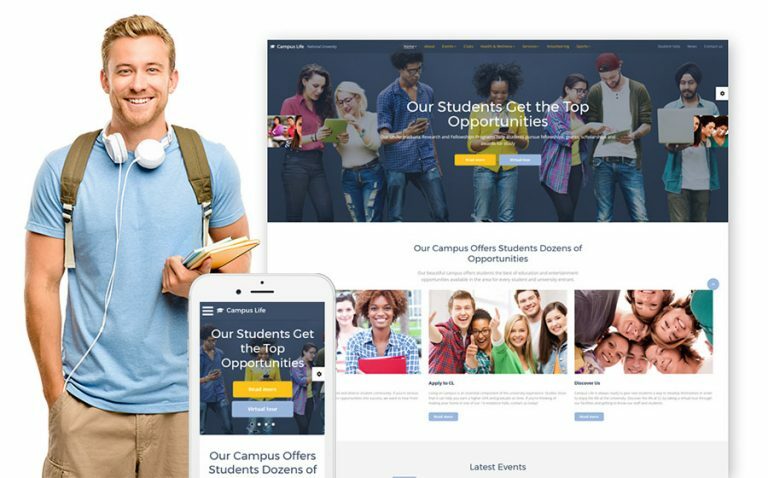 Featuring SEO support, easy-to-follow documentation, and highly responsive layout Campus Life also offers numerous header, footer, and sidebar options, 35+ pre-made pages, simple slider, and social options. Working web forms like contact and newsletter subscription forms allow your visitors to stay in touch with you and updated on the latest news of your site. The package already includes the high res images, so you will not have to waste your time searching for them online. If you’d like to make your online business process simple and well-managed, try Bootstrap 4 Website Templates. Supplied with the elements needed for building a website they can be used by both tech geeks and non-techies, since the editing and customizing process do not require any coding skills. With the help of powerful admin panel and intuitive interface, you can design the site like a pro. 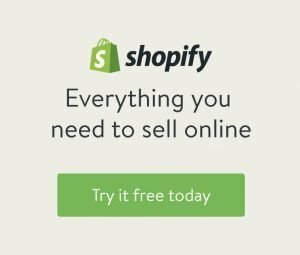 All you have to do is just purchase one of the themes corresponding to your needs, download it, apply minor adjustments, and start running your business online. If you still have doubts about what template to opt for, feel free to contact TemplateMonster support team for a further assistance.